This time on ‘In the Style of…’ we’re looking at Pink Floyd. Although the guitarist, David Gilmour, mostly uses his own judgement on which specific effects and equipment to use, there are some sounds that are definitely favourites. So, when aiming for a similar sound, be aware that Gilmour himself would be a bit more creative. You should be, too. Scroll down for the tab. First of all, you’ll probably need a Strat, or similar singlecoil guitar. Then you’ll want to install David’s signature pickups, and his signature strings. That would obviously be ideal. On the example solo I’ve used none of that. I’m using an amp and effects modelled by my computer and a guitar with EMG active humbuckers. However, the result is the same, and if you want a similar sound, I suggest following these guidelines. First of all, I’m going into a signal booster. 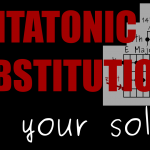 This creates a longer sustain– which is very important for this type of sound. 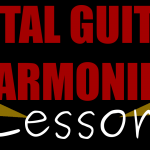 Gilmour likes very flowing, melodic lines, and you can’t do that if your notes die down too fast! It’s usually a good idea to have something like an Ibanez TS9 Tube Screamer (or similar) at the front of your pedal chain. This will help boost the signal through the rest of your effects, or into your amp. Of course, this is definitely more of an art than a science. What works for one guy, might not work for the next. However, in general, a stronger signal from your guitar means more of your tone getting through to the amp. Although his sound is very clean by some standards, David Gilmour adds just enough overdrive to stay mean. He prefers the ‘Fuzz’ style distortion, which is essentially just an overdrive with less high end. On the recording, I’ve used a standard overdrive unit. I’ve turned down the highs slightly, but I’ve not worried too much about this because my guitar has humbuckers (which tend to be bassier anyway). I don’t have the same equipment that Gilmour uses, but I think the tone I end up with is fairly close. Again, this is a great example of how you can adjust things to suit what you have available. I’m sure this is what David Gilmour would do, anyway. If you want to get really close to his sound, you’ll need an Electro-Harmonix Big Muff pedal, but then you’ll also need a Strat fitted with his signature pickups! Again, David is famous for using many different types of amps. Picking just one isn’t so straightforward. However, his main stage amps are made by Hiwatt (the DR-103 and DR-504), and those are hooked up to WEM 4×12 cabs. In reality, any amp that has a decent clean sound will make a great choice. Gilmour has been known to use anything from a Fender ’56 Tweed, to the Mesa Boogie Mark II! If you can get a really clean, clean tone with plenty of headroom (when other effects are turned off), then you’re good to go. If you’ve completed the above steps, then you’ll be most of the way there to getting that Pink Floyd tone. However, you’ll probably have a very dry, and possibly thin sound (especially with singlecoil pickups!). The sound needs filling out. We want a nice, liquid, rich tone- one that makes the guitar really sing! How do we do that? Two things: delay, and reverb. The delay that I’ve used on the record is set to only one or two repeats at about half a second each. The delay unit I’ve used actually specifies this in BPM- so it’s quarter notes at 120bpm, but many will give you this in seconds. If your delay pedal just has a ‘level’ control or something like that, just don’t use too much. We’re not looking for ‘repeats’ here. The idea of the delay is to fill out the sound and make it seem bigger and fuller. On top of the delay, you need (lots of) reverb. I actually underestimated how much reverb to use originally, and had to add more after recording. It’s not a really long reverb, but it’s quite ‘wet’- which means there is a lot of it in the mix. I would love to be more specific, but by this point you’re going to need to use your own ears to get it just right! The backing track to this solo can be found here. The overall idea for this track uses sounds from the E Dorian mode. This is where the first two chords come from in the first half of the progression: Em and A. 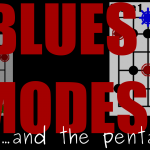 Quick Theory: if you’ve been reading my blog before, you’ll probably already know that modes and chord progressions aren’t used together. I prefer to think of this section as a short E dorian vamp. The actual chord ‘progression’ comes in the second section. After the first four bars, the intensity picks up for the second four bars. The chords here are: Bm – A – D – C. The first three chords are taken from D major (iv – V – I), and then I’ve thrown in a C chord at the end. I actually took a while to work out which chord to end the sequence on, and the C sounded the most ‘Pink Floydy’. I especially like the sound of the C chord here, as it isn’t taken from the same key as all the others. You can think of it as being ‘borrowed‘ from D minor, when the rest of the song is in D major. This is important to understand if you’re soloing over it, because you might need to change the scale you’re using for this one chord. I’m thinking of this track in four bar sections. 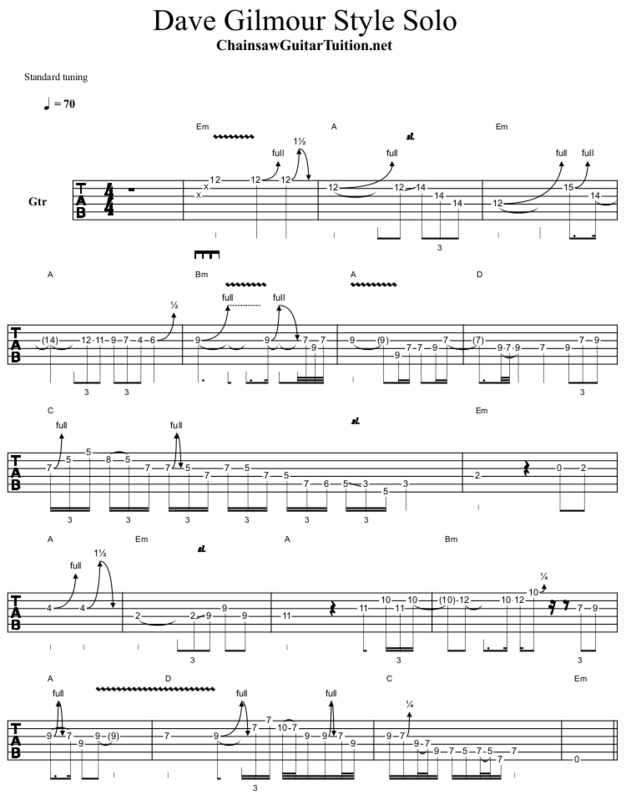 So the first four bars is more laid back (Em – A – Em – A), then the second four bars increases the intensity. This whole thing then repeats. The solo starts off with a rake up to the 12th fret on the high E string. This is the root note of the underlying E minor chord. Now, root notes are safe, but not that interesting, so I then bend up to the 9th (F#- 14th fret; E string). This is purely just for ‘colour’, as just one long note here would get old quickly! Then I do something that David Gilmour does a lot- I over-bend the note. When I say ‘over-bend’, I don’t mean that I’m missing my target pitch. The bend here is 1 1/2 tones, or three frets, instead of just two. If you really want to start sounding like Gilmour, get good at string-bends. Then, don’t be afraid to bend further than you would usually go. This is where signature strings can make the difference! Then we have the A chord in the second bar. Here, I’m using the shape of the open A major chord, but moved up 12 frets. This is similar to what David does on the first solo of ‘Comfortably Numb’, where he outlines the D and A chords an octave (12 frets) higher. For this solo I haven’t worried a great deal about where my phrases are ending. Usually, you’d want to target a note, but throughout this example, I’m playing a phrase and then using string-bends to get it to fit the chord. This is where you need a good ear! I then descend down the neck using the A major scale in the 4th bar. In the next four bars, the drum pattern changes and becomes more intense. We also have a new set of chords: Bm – A – D – C. To emphasise this change, I’ve switched to the B minor pentatonic scale, bending the E (9th fret; G string) up to an F# (a two fret bend). The target notes I’ve used for this section actually descend over the chords. Over the B minor, I’m targeting an F# (9th fret bent up to 11th fret on the G), over the A, I’m targeting the E (9th fret; G string), and over the D, I move down to the D (7th fret; G string). That’s the easy part. Now, the C chord doesn’t technically belong in the same key as the others. The B minor pentatonic scale should still work, but I’ve chosen, instead, to switch to the A minor pentatonic to emphasise this chang. This short scale run leads us down to the C (3rd fret; A string), and is actually easier to think of in groups of three for the first three groups of notes. Then we’re descending using the blues scale. For the next part, I’ve kept things simple. I start with an E note (2nd fret; D string) over the E minor chord, then in the second bar I’m bending the 4th fret on the G string to target the C# in the A major. Then, in anticipation for the second build-up section, I slide back up the neck. Sometimes the easiest way to change the intensity of a solo is to just move where you are on the neck! 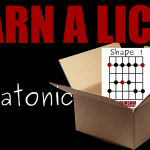 I’ve also switched back to the B minor pentatonic scale (first shape). For the last four bars, I follow a similar pattern to before, using the B minor pentatonic scale right up until the end. 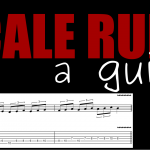 The last scale run uses the first shape of the scale, and ends on an E note (7th fret; A string) over the C major chord. Then, the last note is the open low E string, which fits to the E minor chord in the backing track. 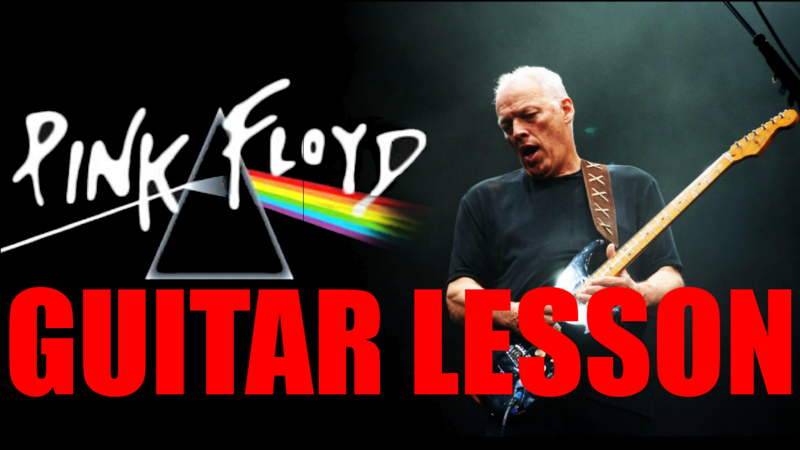 To get close to David Gilmour’s sound, you’ll need the pentatonic scales, a good knowledge of chord tones over the whole neck, and lots of reverb! It might not sound like much is going on from a technical perspective, but unless you can target the right notes over each chord, playing like this is next to impossible! One of the most important things you’ll need to play like this is a good ear. That will tell you when you’ve hit the right note (and when you need to bend). It’ll also help you getting those 1 1/2 fret bends on pitch! 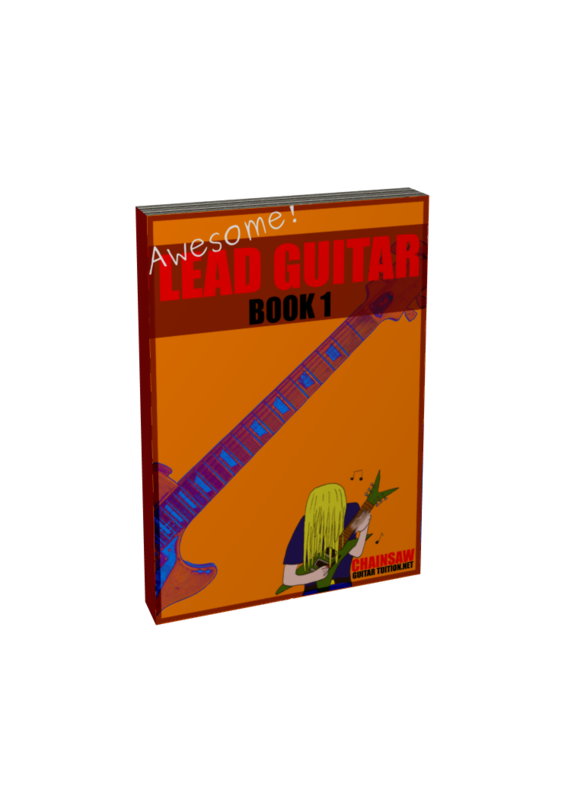 If you really want to get into playing lead guitar, my new book ‘Awesome Lead Guitar’ is out now. In it you’ll learn the most common scales and techniques that lead guitarists use with full scale diagrams and tabs!